Duranglers fly shop was my go to shop when I lived in Durango Colorado in 1992 and 1993/ It is where I took my very first fly tying lessons and got schooled on the best patterns to fish on the Animas River and other surrounding waters. It is where I learned the incredible value of the Royal Trude, a lethal caddis pattern in those parts. So I was very pleased to come across their site and learn that are hosting a fly fishing festival in my old haunts. Here is the skinny. Be sure to check out all of the activities and scheduled events for the exciting couple of days that they have planned by checking out Duranglers’ excellent website. It’s that time of year! 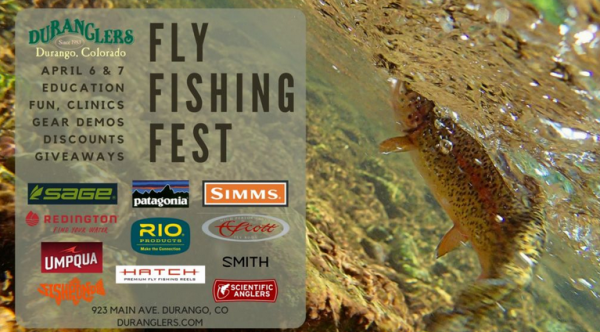 Spring is almost upon us and now is the time to start thinking about our upcoming Duranglers Fly Fishing Festival. Don’t miss it folks, it sure to be a great time! THE 2018 FLY FISHING SEASON IS HERE! GET PREPARED WITH NEW KNOWLEDGE, TECHNIQUES, AND GEAR. TWO DAYS OF FUN, EDUCATION, CLINICS, DEALS AND DEMOS WITH DURANGLERS AND OUR FLY FISHING INDUSTRY FRIENDS.